Yes… you read that right. I have target panic, actually, I have severe target panic. For starters, I’ve had target panic off and on for a number of years since roughly 2009… actually, that isn’t true as I’ve never really been free from this tight grasp and I should have stated that I have target panic on a daily basis. The first step toward fixing something is admitting you have it, right? 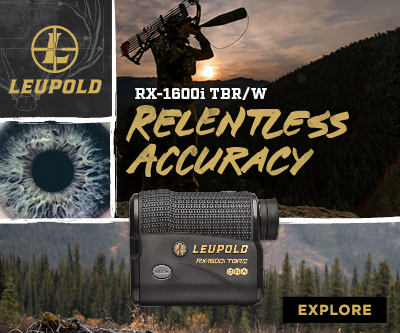 This fact was slammed home to me back in early June when I was shooting with some of the guys at the office at our local archery range. I still remember it to this day, we were on target number four, a relatively easy 55 yard uphill shot. I came to full draw, settled in my achor points, and everything went haywire from there. You can see a few clips of this on a goHUNT OFFSEASON video here. My section is at the 3:20 mark in that video. I completely broke down to a point I have been never experienced before. It was then that I knew I needed help. What exactly is target panic? 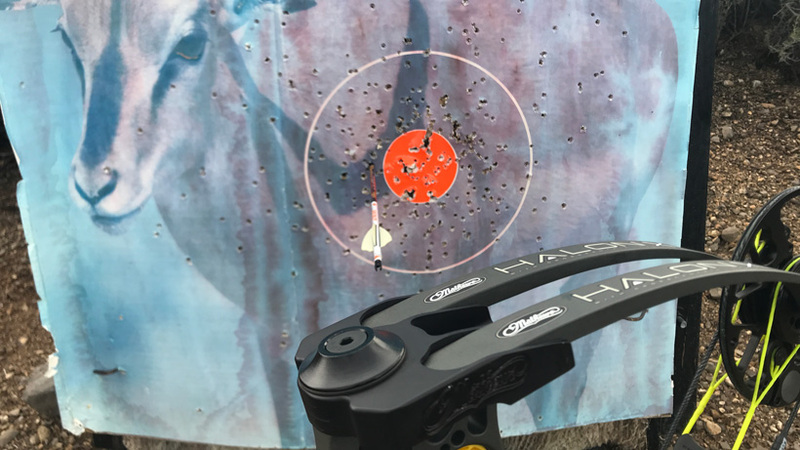 If you need a quick refresher on target panic, I suggest you check out this great article by Trail Kreitzer called Target panic: What to do and how to beat it. Basically, it is freezing off target or flinching while you are in the act of shooting an arrow. Throughout the years I’ve managed to scrape by when it comes to my anticipation. Target panic seemed to come and go for me, but the more I practiced the worse it got. I’m the type of person who loves trying to get the most out of my equipment and I want to be as precise as possible when I release an arrow. 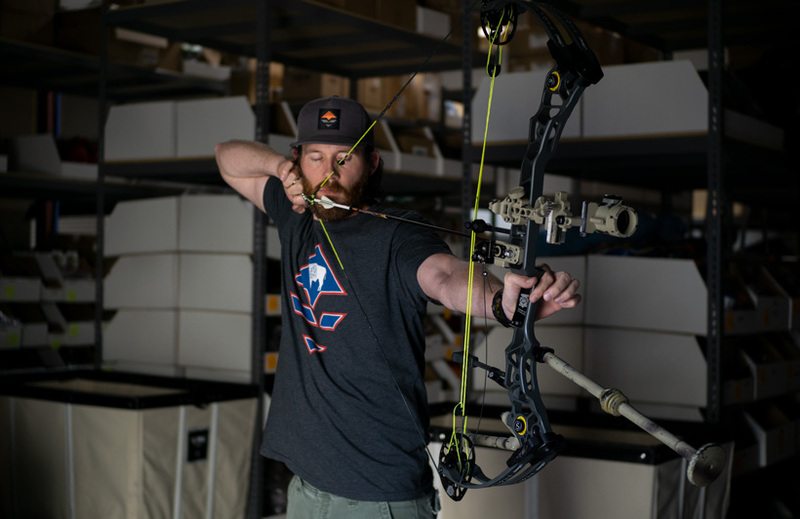 When I’m on top of my archery game, nothing seems to get in the way with my shooting. I can shoot lights out and I’m having the time of life. I’ve had several seasons where for whatever reason my target panic went away completely (again, I doubt it went away completely, but I was shooting great). Then there have been times when I’m downright struggling. And struggling to the point where I kept trying to fight target panic, and no matter what I did in my practice sessions, the worse it got. I’ve tried to get rid of target panic in the past. I’ve read countless books and watched a plethora of YouTube videos… but there was one common theme that kept getting in the way, me. I never fully committed to a plan and I never admitted there was a real problem. So to help myself and hopefully others that are struggling with target panic, I’m going to lay out all my steps in a continual article series. Each article I’ll go through everything I did the previous weeks in what I'll call my “roadmap to target panic freedom” sessions. I’ll also link any new books I’ve read, articles I read or YouTube videos I’ve watched since the past article. I started my target panic work back on June 20 and I feel like I’m just scratching the surface. Also, my hope with this article is to get feedback from people on what worked for them when they went through this process of curing target panic. At the same time, I do realize that the title of the article might scare a few people off. I know a lot of people in the archery world who can’t even say the word target panic for fear they will catch it. Target panic… It’s all in my head. I know that, but I guess at the same time I don’t actually know that or believe that is true because I haven't committed to fixing it. I am determined to get rid of it. For me, it seems that target panic is more like a fear. This is completely my fear of slightly missing the X and by slightly I mean by a hair. I want to be perfect. I believe my target panic got this way due to the amount of pressure I put on myself to be perfect. The target panic I have causes me to freeze low. No matter what I do, I can't lift my pin and let it float on the spot I want to hit. What follows is more of a journal/diary of my process than an article. These are a bunch of notes I wrote down during each week of this process. I also kept a journal of all my arrows and practice sessions so I have something to look back on and to track progress. 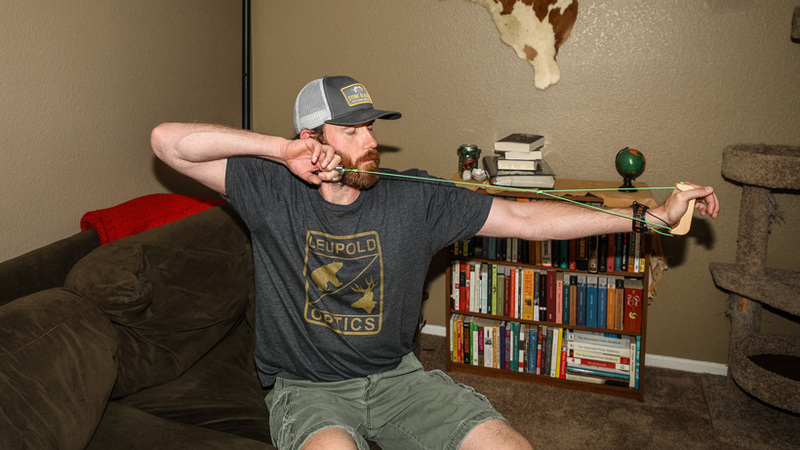 I hope that through this article series, that I can develop an open dialogue on target panic and not only help cure this for myself but for all the other bowhunters who face this same burden. What I would like to stress through this process is I feel like the only way I’m going to get rid of target panic is by having self-discipline. Would I love to head to the range and run through a round of 3D right now? You better believe it! At this stage, I’m less than two months out from the opener of my archery season. But I know if I abandon this practice, I will start to slip back into my old ways. It’s sad to say, but due to my target panic, I’ve passed up a few opportunities to practice with friends at the range. I wanted to fully commit to getting rid of target panic, so to do that, I went into a hole in the ground. But… it was for the better. My first week started on June 20 and this week has been all about my mental game. I was goal setting, planning and diving into the literature on the subject. This has lead to re-reading books I picked up back in the day and actually reading them word for word and destroying the pages with notes. My goal... to cure target panic and to know that's okay for my pin to float around the X. Like I stated above, I decided that if I was going to go through this process correctly this time, I was going to re-read all my favorite archery books again. These are a collection of books I’ve had forever and if you have any other book suggestions in regards to archery or even the mental game of athletes, please let me know. All of the books are gems, but if I had to pick a few favorites that really helped me it would be Joel Turner, Lanny Bassham, and David Mack's books. 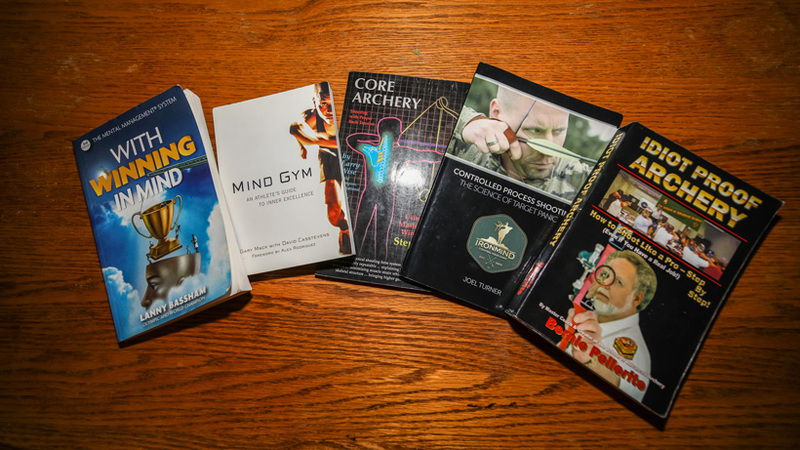 The mental game is huge in archery and these books really break it down through a lot of great lessons. Shot execution training on a Right Release. After reviewing Trail’s article again and talking to him on the phone, I knew I wanted to start back at square one. I needed to reprogram my shot sequence. I’ve shot all sorts of release aids over the years. 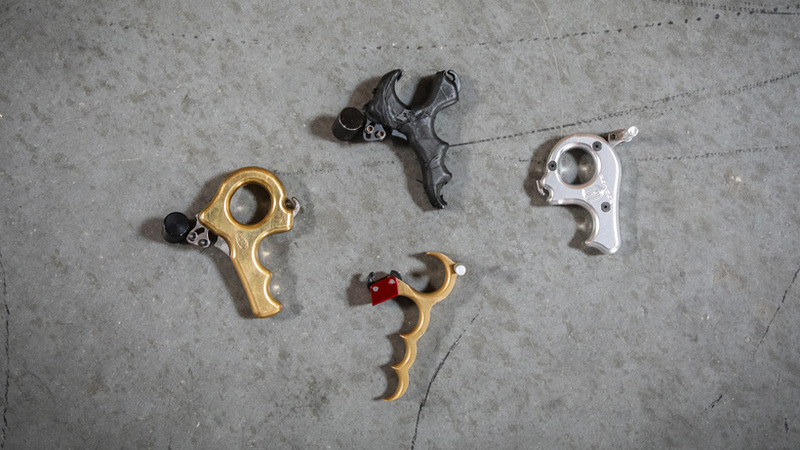 I started bowhunting with fingers, quickly move to an index finger caliper release and then back in 2009 I switched to a thumb activated release. It wasn’t long after that that I picked up a hinge release in 2012. With my bad habit of anticipating the shot, I could easily punch all of them. I could even punch a hinge and force it to go off on command. It was this reason that I didn’t want to go through this practice with a hinge and decided to pick up a tension activated release. I settled on the NockOn (Carter) Silverback. I’ve always ran a four finger thumb release, but I normally drop or don’t place any pressure on my ring finger, so that is why I went with the two-fingered Silverback instead of the Carter Evolution Plus. String training device I built back in the day. 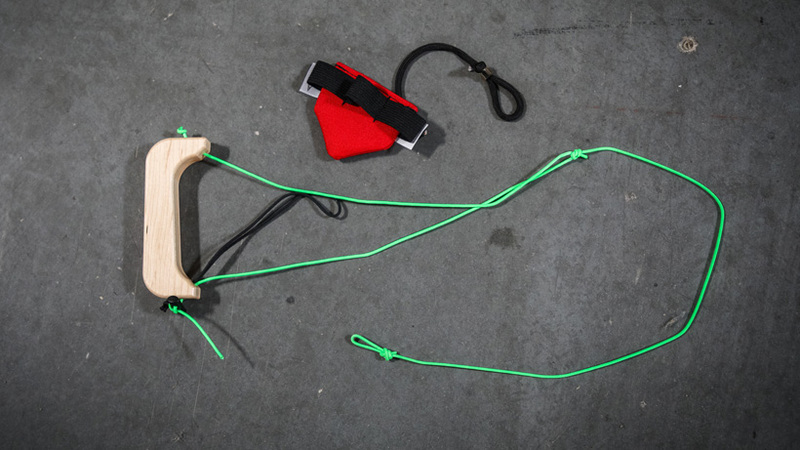 During this stage, I started by using a string training device that I made back in 2012. 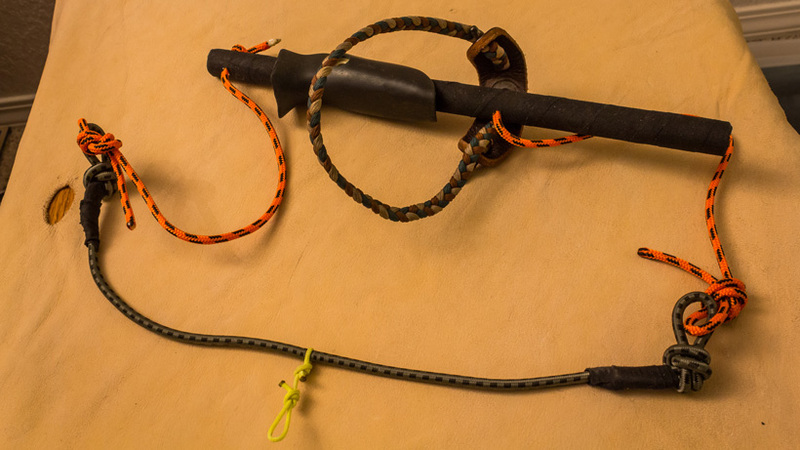 It wasn’t long before I purchased a different string device that was a little better built than the cheap device I built with an old ski pole and some cord. 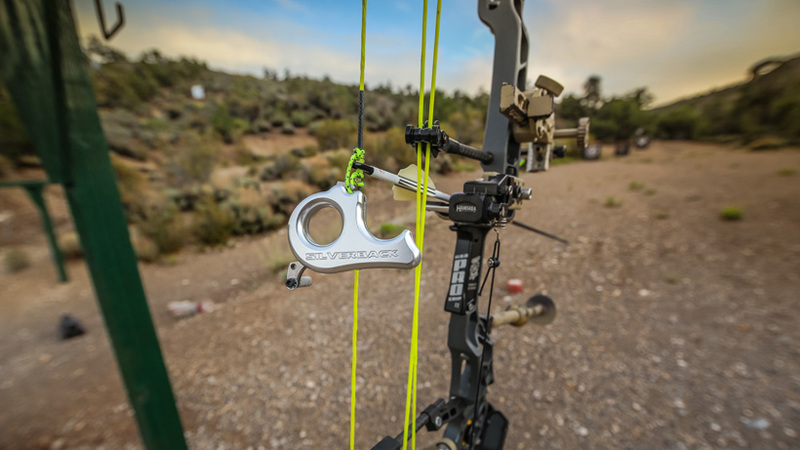 It turns out that my good friend who owns Don’t Choke Archery built one such system similar to my old design and then further consulted with John Dudley of NockOn Archery to start manufacturing the Right Release. Archery shot execution training device with my eyes closed to further work on making the perfect shot. The first stage was just drawing the string back and holding it at full draw while taking a note of where the tension is in the draw side of my body. Trail described this as if I was trying to crush an orange between my shoulder blades. The front half of your shoulder blades stay steady as the back half squeezes. The tension in the drawing side of your body should sit behind the shoulder blade. I would then practice this over and over on the string to create muslce memory. I even take this tool the office and practice with it throughout the day. My goal through week two was only focusing on the shot process and my shooting form. I am shooting with my eyes closed to further nail down that perfect shot execution. To sum up this week, I would call it pure focus. I’m only concerned with making a perfect shot over and over again. I’m still trying to stress pulling, pulling and more pulling with the tension activated release. Everything I have read and listened to keeps pointing to taking my rear elbow and imagining pulling through to something behind me. Joel Turner’s method in this stage really hit home with me. The only thing I would let my mind think about during this stage was, “pull, pull, pull, pull…” until I got the shot to break. Since early on I was trying to cram as much knowledge in as I could, I kept to books. But this week I dove deeper into podcasts. In this area, I mainly turned to John Dudley’s NockOn podcast and any podcast with Joel Turner. John is a wealth of knowledge. He’s probably forgotten more about archery than most have learned. If you don’t know about him, I highly suggest you take the time and read his articles and dive into his NockOn podcast. Let’s be honest, most of us are visual learners and as much as I love to consume editorial content or podcasts, sometimes it’s nice to just watch a video. When it comes to re-learning archery techniques, a video is one of the best formats out there. NockOn - How to cure target panic - Learn what it is and how to fix it! 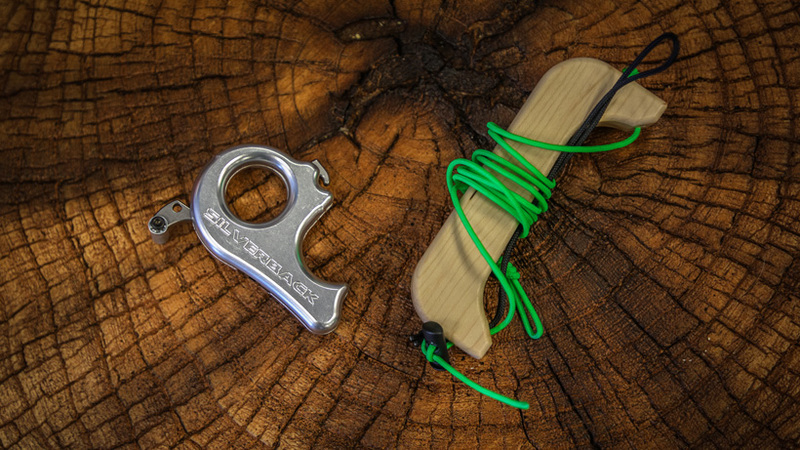 NockOn Silverback tension activated release and string training device. This week was a little difficult due to me visiting my parents in Minnesota. But, I still managed to daily practice sessions on the string device. I flew to Minnesota with my string training device and the tension activated release. The great thing about practicing with this tool is you can literally take it anywhere and practice anytime. I’ll be the first to admit, this process seems like it takes forever… but I knew it would do wonders for me. You’d be amazed at how easy it is to practice if you just keep your training devices with you at all times. I even take my string trainer and release to the office every day and find time to take a few shots. On July 9-11 I finally picked up my bow and started blank bale shooting. More on that process on the Week 4 description. As I mentioned at the end of Week 3, I finally felt ready for blank bale shooting. This was a stage where I wanted to take everything I had done up to this point and apply that to blank bale shooting. I feel like blank bale shooting was one of the best practice methods for me. Properly executing a blank bale session takes a ton of time. You can't just walk up to the target and expect to shoot a ton of arrows in 10 minutes. I wanted each arrow to be perfectly shot. I would come to full draw, settling in my anchor, close my eyes, and then I would just concentrate on pulling. I placed extra emphasis on removing any other thoughts in my mind and focusing only on the shot process. For the blank bale series, I went out to my backyard and shot at least 50 arrows or more a day with my eyes closed. I would then follow this up with more string practice. To add even more arrows a day, I would also take my bow to the office and shoot at lunch and after work. Note: anytime that I started to feel fatigued, I would stop and take a break. I feel that blank bale shooting with fatigue could create bad habits. This week I’ve been re-enforcing my blank bale shooting, but now I’m actually shooting with my eyes open. Painting old target white so I can open my eyes and prevent my mind from focusing on a dot. 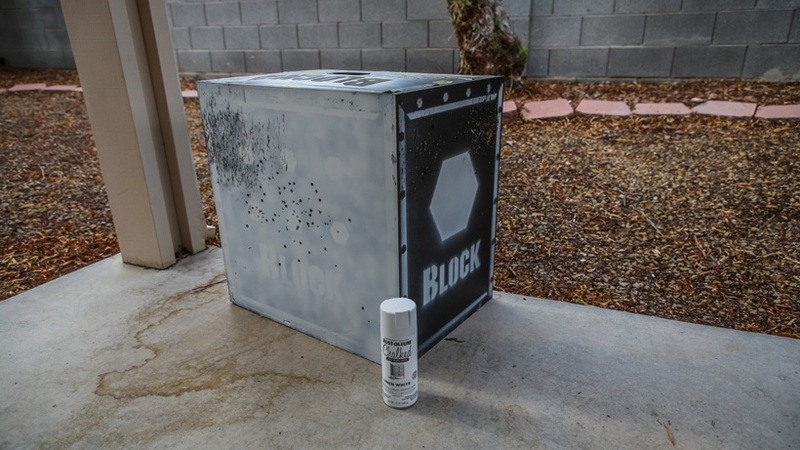 For this stage, I didn’t want to have any bad habits creep back in, so I spray painted an old target I had laying around white so I couldn’t let mind naturally aim at anything. Note: white might not have been the best choice to paint my target, as it didn't really cover the target that well, but I continued to paint the target and in the end it was whiter than the target photo above. I picked up this great tip from John Dudley on one of his YouTube videos. You can check out that video here. Another thing John Dudley mentioned was to place something on your sight housing so you can’t intentionally aim at the target. So in a sense, this is sort of like blank bale shooting with your eyes closed. I took his suggestion and printed off some of his charts, but later in the practice sessions, I switched from an animal face to just a white piece of paper. 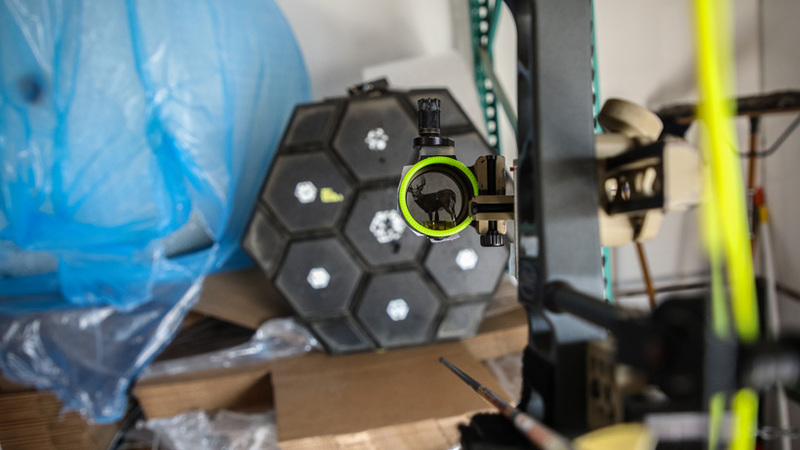 I wasn’t sure how my mind would handle looking at targets again, even if they were taped in front of my sight. So I opted for the white piece of paper most of the time. I also experimented with taking my sight off the bow, but due to a ton of bowfishing that I used to do, I felt this might actually hinder me since I bowfish instinctively and might resort to some bad habits of canting my bow like I did on my lever bow. This is also the stage that I started to perform a technique that I saw in Levi Morgan’s target panic video. I would come to full draw, anchor and pick a spot on a target from a close distance and just hold until muscle fatigue set in, then let down. I felt this was a great addition to my practice sessions as it allowed my mind to wrap around that idea that I didn't need to fire an arrow. I could just let it float freely. 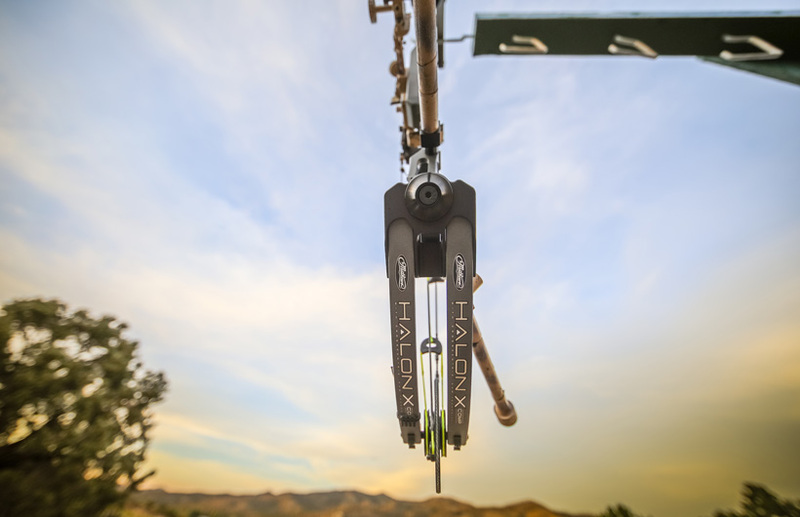 My Mathews Halon X Comp after a successful trip to the range. I’m happy to say that I’m at a point where I’m now shooting at targets! I spent the early part of this week blank bale shooting with my eyes closed and open. Then, during the weekend I went out to the range. During the weekend I broke up my shooting into four stages. String practice with my eyes closed to start off the day. Next, I did a few rounds of blank bale shooting. Actually shooting at targets at the range. And finally, back to blank bale shooting to end the day. This was the target that destroyed me a month ago and was my first shot back at the range after working to beat target panic. I know I have a long way to go... but I'll take a left miss any day over freezing low. Honestly, I can’t believe how far I’ve come. I was able to draw my bow, settle into my anchor points and I let my pin just float (insert emphasis on floating here). I added that last part as I’ve never really felt this pin floating sensation before. I had always fought my pin, and now it was just floating around and my mind was able to let it float all the while I kept repeating in my head, “pull, pull, pull, pull, etc.” I have a long way to go in this process and will continue to produce more articles on how things are going for me. This has been a very long process, but I can tell that all the hours reading content, watching videos and actually executing a plan are going to pan out. I still have a ton of work to do. The biggest thing for me has been trusting my mind to allow the pin to just float around. I feel I now have the groundwork laid out to continue this process into the next week which will be days out before I leave for my first bowhunt of the year. Bowhunting and archery have formed some of the best memories and friendships of my life and I can’t wait to get back to that enjoyment stage! My week seven steps have already begun, but more on that next week. Until then, if anyone has any words of wisdom, I’m all ears. I have been doing some digging around and haven't really seen a whole lot about changing the bubble level on the bow. Have you every thought about this too or done it or known anyone who has done it. 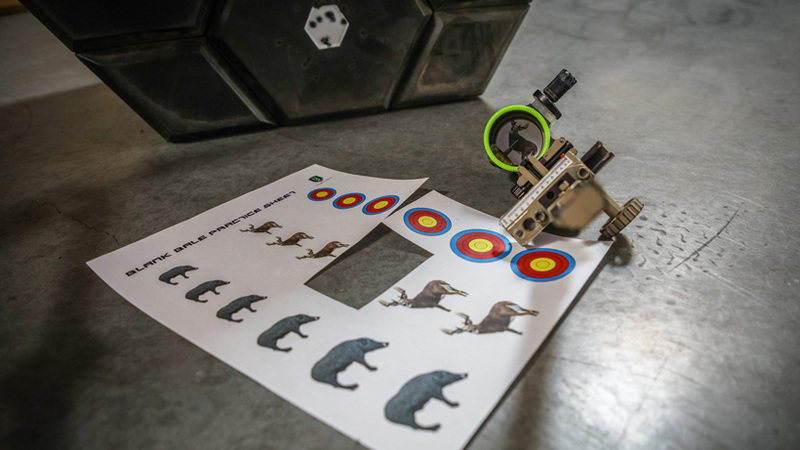 I am just trying to see if there is a level that will have enough contrast that, when at full draw and lining up a pin, one is able to use their peripheral vision to "look" at the bubble and simply keep focus on the target. p.s. This question is in no way directly related to the article. I am just trying to pick Brady Millers brain; or anyone else's for that matter. I remember reading this article last month when it posted and thinking, "Man, I sure hope that doesn't happen to me." Fast forward to today, and I will unfortunately be starting this process ASAP. The last few sessions at the range have been an absolute disaster. Hopefully these steps will help get me back on track! That was a great article, good work Brady. Thanks for the great article. I'm curious about your take on Lassam's "With Winning in Mind" and Joel Turner's controlled process shooting, as they appear be arguing the completely different perspective. Lassam states that you should let the subconscious take over and not really think about the shot (as I understand it), versus Turner saying that you need to make a conscious decision to intervene in the shot and even let down if necessary if the process is going off the rails. Which position do you subscribe to? I lean towards Turner's perspective. Brady awesome article. How does one diagnose target panic. I am sure I have it as I tend to punch the trigger here and there but I also don't consider myself an elite archer (something I am working on). Also, I have heard the term let the pin float before but not truly sure I know what it means. Can you describe what you mean here. This is very helpful! Thanks Brady! Single most helpful article on this platform. I intend to follow this program. Bought my first bow a few months ago and just starting out. Feel this prescribes a good way to start out. Thank you! I had target panic from 1994 to this summer. I finally bought a hydraulic release that fires after a period of time at full draw. I practiced with it for a full month without shooting any other release style and can now place my pin wherever I want on the target with any release type, even releases with crappy triggers. Consider the hydraulic type - you cannot manipulate it to fire on command. Good luck. By the way, I have clicked on your articles regarding your packing list and cook-less method of eating dozens of times. Well, you clearly wrote a helpful and encouraging comment as a member of the national grammar police. Nevermind your use of the singular "contest" instead of the plural "contests". Stick with what you are good at, i.e. trolling.... er I mean, commenting. Seriously helpful article. I really like the idea of shooting at blank bales to get the rhythm, timing, and feel down. Thanks for doing this. Thank you for the article, it is reassuring that you have arrived at many of the same steps and conclusions I have discovered in my battle over the last two years. Over that time, I have come to believe TP stems from a person's personality and their drive to master or perfect the shot "RESULT". I would recommend that in addition to the many steps outlined in your article, the mind has to be retrained to focus on the "PROCESS" of the shot not the resulting impact. A good executed shot (process) may not hit the X, but it must be valued above a badly executed shot that happens to hit the X (result). Once you free your mind from result oriented thinking during the shot, the process of shooting becomes truly refreshing and enjoyable again. Well you clearly wrote a fine article. I believe every word was spelled correctly. Considering the amount of time that you have invested in your unsuccessful quest to cure your target panic, I'm thinking that you should just stick to stuff that you are good at. You know, just stick to journalism and participate in as many spelling contest as you have time for. Similar to me and my poor basketball skills, perhaps shooting at stuff with your archery gear just isn't your game. OK, seriously...I thought the self deprecating approach to the article was funny and interesting. So, OK, seriously...are you like some kind of a ten time national archery champion? I really appreciate you putting together this article. I've had target panic off and on over the years and had a severe re-occurence this year that I've been dealing with. No one wants to admit having target panic, but anyone that shoots consistently for many years will eventually deal with it. The amount of information available out there isn't much and your article has done a great job of summarizing everything that I'm aware is available. At this point, I've read and done many of the things you outline and can happily say that I'm back on track and ready for my September Elk hunt, but I know that I have to continue to be mindful not sliding back into target panic by continuing to do release drills and blind bale shooting to keep sharp. Thank you for putting this out there and good luck in getting back on target. In the end I see this as a journey that will actually make me a better shooter and I'm confident you will too. Thank you, Zachariah! It's a slow process, but I truly believe I'm finally on the right track. Glad you enjoyed the article. This is the best article yet, I ordered the back tension book.